I’m Alison Ellis. I help talented florists increase your income by booking better clients who truly dig your work so that you can have more fun and build authority in your business. Grab my FREE e-mail course “How To Book More Weddings More Quickly“. How To Book More Weddings More Quickly. Pros know: The right business advice can take years off of your learning curve! I believe in the art of good business. My mission is to educate and empower floralpreneurs to achieve their business goals and build long-lasting brands, which is why I share heartfelt advice from my personal experience with professional florists around the globe in my free videos, online business courses and Facebook communities. Read success stories from real florists who’ve tried my courses here. I’ve been a floral designer for over 24 years. I have a Bachelor of Science in Plant & Soil Science from The University of Vermont, as well as a minor in small business. I started my own home-studio floral business, Floral Artistry, in 2002 out of the kitchen of our 2nd floor apartment and 2019 marks my 18th season in business. I took my first hands-on floral design class at a summer camp in 5th grade. I started working as a florist at the age of 16, and my 28 year old boss, the original flower boss in my world, taught me everything I needed to know in order to work solo-shifts at the flower cart; which I did for the next 2+ years as I worked about 20-24 hours a week during the school year…and more during summers and holidays. I can still remember my first Valentine’s Day, it was bananas!…the pressure to keep up the pace was intimidating, as well as invigorating…and as hard as I worked, I had a lot of fun, too. I worked at 6 different flower shops between the ages of 16-25, specializing in everything from bucket washing to cash & carry wraps to customer service to wire-service orders to wholesale purchasing to my very first experience with wedding work in 2001. I’ve learned quite a few tricks over the years and I’ve perfected a few tricks of my own. In November 2015, I released my very first course, Flower Math, and I’ve been creating courses ever since. I really do love to talk about the business of the flower business. I first started sharing my real flower business “stuff” with florists as a guest contributor on FlirtyFleurs.com in 2011. I’m a business contributor to Florists’ Review Magazine, and I recently wrote a 4-part series for Botanical Brouhaha, and I’m a member of the Chapel Designers. “Alison is that mentor/friend that every florist should have. A floral designer with initiative & business savvy is what I call a “floralpreneur®”. Floralpreneurs who take my courses range from 30-year floral industry pros (a species known as the “flora-saurus” as one industry pro wrote to me!) to aspiring business owners & designers in their first few years (or even months!) of business. You don’t have to buy anything from me to be a floralpreneur®! Join my free Facebook group here & Try a free course today! 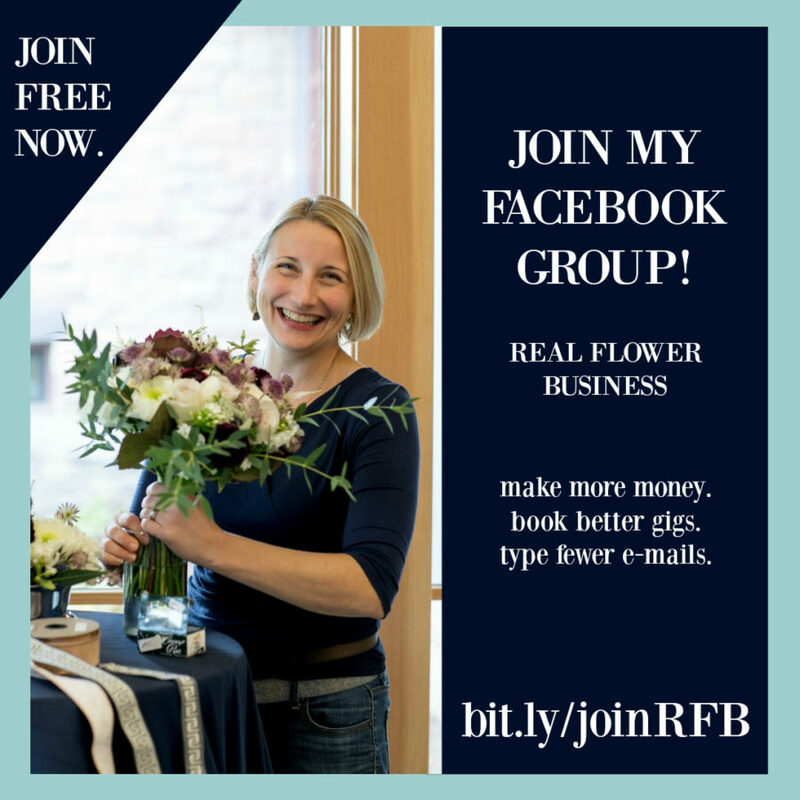 My online business training for florists include free video training courses, downloadable pdfs, and my Floralpreneur® Mastermind Series including Flower Math, The Art of Good Business and private 1:1 coaching sessions. Which course should you take first? However, what I’ve noticed over the past few years is that the #1 thing florists struggle with is pricing and as a business owner I believe the #1 most important thing for you to understand is how to price your work! Turning a profit is essential to staying in business. If your pricing and profitability foundation could use some reenforcement check out Flower Math first! If you already have your pricing on lock (you’re making 70% profit on the cost of your flowers and supplies), then what’s your current burning question? Question: Your website isn’t as awesome as you/your work? How can you work with Alison one-on-one? I live in Vermont with my husband and son, along with our very sleepy cat, Lily. Find more free resources on my Blog here. I’d love to hear from you! Ask to join my Facebook group here.